Provides quick and easy movement of dies from the press to the storage or staging area. Excellent alternative to expensive die carts. Available with cylindrical or ball bearings. Both styles can be ordered with high-density bearing surface for maximum load carrying capacity. 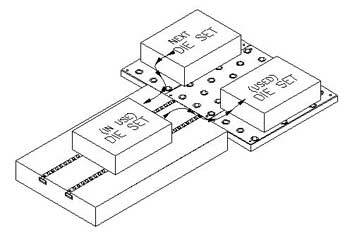 Designed for easy staging of dies during die changeover. Can handle die weights up to 1,800 lbs. per square foot. Economical alternative to expensive die carts. High quality precision ground chrome ball bearings for easy die movement in any direction. Heavy duty rollers for a lifetime of reliability.